. Published on October 21, 2014 . 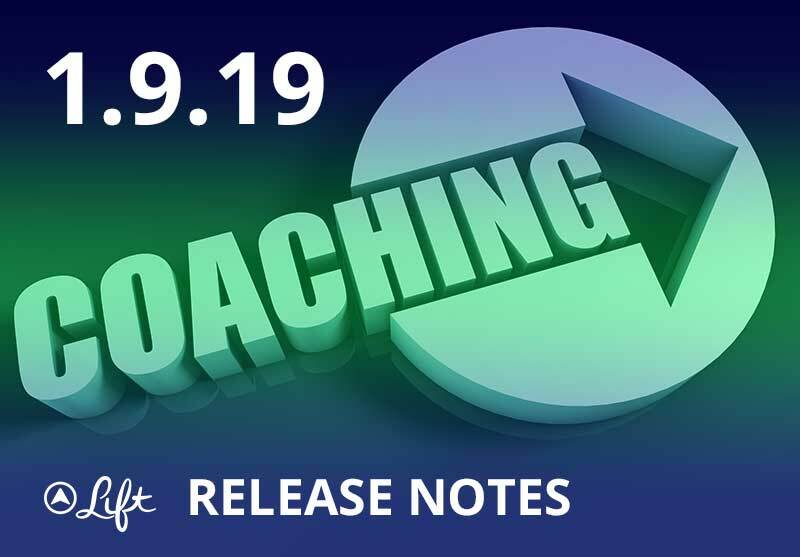 This release adds features for people who have tried our new one-on-one coaching feature. Sign up is only available via our blog or newsletter. For people with coaches, you’ll now see a coaching tab on the bottom right of your screen. This tab adds one-on-one coaching chat. If you’re a Lift coach, this coaching tab also shows a coaching dashboard to help you keep track of all your clients. One-on-one accountability coaching is an upcoming feature and won’t be available in the app until next release. If you can’t wait, and want to hire a coach right now, please visit blog.lift.do. Read on for more on coaching. Imagine Lift as your personal training team that coaches you in every goal that you care about. You coach yourself through the accountability of streaks and targets. The community coaches you by answering your questions. But, for the first time in the history of the world, we’re going to make real, expert coaching accessible to everyone. If you’re at all like me, you probably thought that having a coach was a luxury that you left behind after high school (if that). I ran my last high school track race in May of 1996, thanked my coach (Andy Leong) for helping me grow as an athlete and person, and then started a journey of adult self-improvement that often felt very lonely. I’m certainly aware of coaches for adults. Professional athletes have so many coaches that they even have specialists in charge of minutea like how they stretch. Steve Jobs used an executive coach who used to be a Division I football coach. My gym has a wall of pictures for all of their personal trainers (but seriously, am I really going to pay $70 per workout session?). These coaches can be really good, but they’re also really inconvenient. The gym trainers are the cheapest at $70/hour. But many of the best coaches and trainers are hundreds of dollars per hour. They require face-to-face time which requires scheduling and often travel on your part. And, before you even get to those inconveniences, how are you going to convince yourself that a coach is even worth the money? A certificate from CTI didn’t mean anything to me when I started Lift (although it’s quite a good coaching certification). All of that is to say that most of us don’t have coaches because having a coach is a ridiculously inconvenient luxury. That’s the setup for why I’m so proud of what we’re doing at Lift. We’ve found a way that everyone can have a coach. We ve dropped the price by an order of magnitude. An in-person coaching session will run you $150. Our coaches will train you for $14.99/week. We’ve redefined credentials to be performance based. All of our coaches are recruited based on personal success. What you’ll see on day one is their check-ins, streaks, and answers for the goal that they are coaching. Later, we’ll show you their track record with clients—do their clients have a higher success rate? That’s the only credential that matters. We’re going to make hiring a coach ridiculously convenient. They’re going to be right their on your phone. And we encourage people to switch coaches until they find someone who has the right chemistry for them. Hiring a coach shouldn’t be a risky proposition. We’ve organized the coaching to be immediate and action oriented. You should be making progress on day one. There should be no month-long delay while your coach learns your family history. This isn’t therapy. We call this Lift’s Momentum Methodology. I’m way ahead of myself though. All that’s in this release is the chat feature that allows your coach to keep in touch with you and the coaching dashboard that lets coaches see all of their clients in one place. If you want to actually hire a coach, you’ll have to go to our blog or wait for the next release. I just want to put this idea in your head: you deserve the luxury of having a coach.